Pub crawl? Take a pudding crawl down Portswood road instead! Start with Bar Three Diner and then head to Sprinkles, Scoops, Trago, the lot! Learn something new – take advantage of all the different societies – it could be a new language, a new sport, whatever you want! 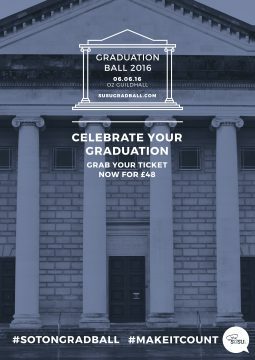 Celebrate your time at University at Graduation Ball 2016! Have you got any bucket list suggestions to add to the list? Get in touch at @Union_Soton with your ideas. If you were lucky enough to get Grad Ball tickets, stay up-to-date with announcements on our Facebook event here.